Patients can use their smartphones to register for a My Health Online account. To help ensure that all people in our community have access to quality care, Sutter Health has piloted an Adult Asthma Program partnership in Oakland with LifeLong Medical Care to help reduce the health inequity that currently exists for African-American adults seeking care for asthma. The pilot program enrolled 50 patients in 2017 from the more than 400 who were treated at the Alta Bates Summit Emergency Rooms in Oakland and Berkeley. These patients had one-to-one appointments with a respiratory therapist at LifeLong Medical Care and received asthma education so they could manage their disease. Since the pilot program’s launch, only one of the 50 enrollees has gone back to visit the Alta Bates Summit Emergency Room for asthma related symptoms. 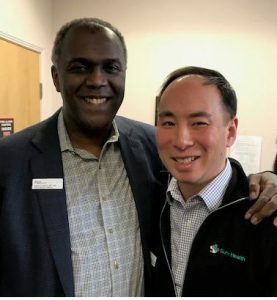 Stephen Lockhart M.D., Ph.D., Sutter Health’s Chief Medical Officer and Albert Chan M.D., Sutter Health’s Chief of Digital Patient Experience at the Sutter Health Telehealth event. Patients also had a home visit from social workers to evaluate their home environment and assist people with poor housing conditions such as pests or mold. According to the Centers for Disease Control, asthma is one of the most common chronic illnesses in the United States, affecting about 25 million Americans. The racial disparities in asthma occurrence is substantial. African-Americans are three times more likely to be hospitalized for asthma than people of other races or ethnicities. Sutter Health is now offering free telemedicine access for LifeLong Medical Care adult asthma program patients. This means that patients can schedule a live clinical consultation from their computer or smartphone. Sutter Health advance practice clinicians are available every day from 8 a.m. to 8 p.m. to treat a variety of health conditions including infections, coughs, colds and respiratory issues. Sutter Health Telehealth team members provided tutorials and helped patients sign up for My Health Online. 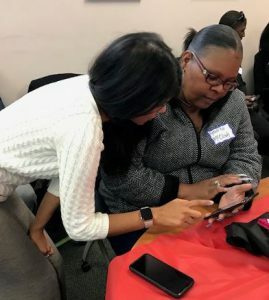 On Thursday, January 18, Sutter Health invited LifeLong Medical Care’s asthma patients to attend a “Telehealth Pizza Party” at LifeLong’s East Oakland care center. Dr. Chan provided a live demonstration of how the virtual care visit technology works and help patients register for an account using Sutter Health’s My Health Online. To learn more about Sutter Health’s Video Visits, visit our website: www.sutterhealth.org/video-visits.